This flight was part of my journey from San Antonio to Australia. I’d flown Fiji Airways before and was expecting a similar experience on their A330. My expectations couldn’t have been further from reality. This ended up being one of the most disappointing flights I’ve ever taken. Since I was coming off an American Eagle flight from Los Angeles earlier in the day, I didn’t need to worry about checking in. I spent the day exploring San Francisco with friends before returning to SFO at 8 pm, three hours prior to departure. Fiji Airways business class passengers can use the Virgin Atlantic Clubhouse at San Francisco International Airport. Some Virgin Atlantic Clubhouses are stellar and considered some of the best lounges in the world. This one was, sadly, somewhat underwhelming. The lounge was very small and incredibly packed. There were only two tables available to sit at and order food. There was a dine on demand concept in the lounge with servers coming around to take orders. I ordered some salmon since I knew Fiji Airways wouldn’t serve a substantial meal this late at night and I was hungry. The portion was tiny. 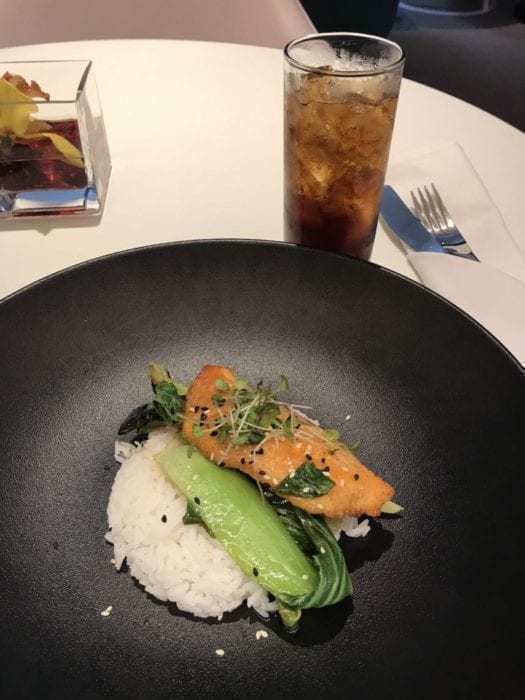 For reference, the piece of salmon was about half the height of the glass of soda in real life. I was able to finish the snack, really, in a grand total of five minutes after waiting 45 minutes for the dish to arrive. It was by no means stellar, but it was decent. I’m assuming by minimizing portion sizes Virgin Atlantic is able to keep costs down. However, in plenty of other lounges, visitors have access to a self-serve buffet. 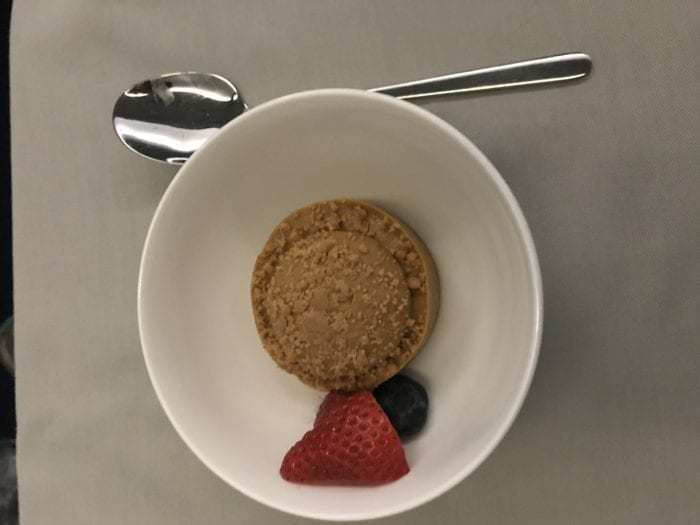 Though Virgin Atlantic doesn’t have space for a buffet at SFO, they definitely could enlarge their portion sizes slightly. For many people, they may choose to eat on the ground in the lounge before a late night flight to maximize their sleep time. The Clubhouse was small and offered a few varieties of seating options, including dining tables, lounge chairs, and bartops overlooking the airport. Virgin Atlantic’s Clubhouse also had a manned bar available for passengers. The Clubhouse also had showers. I didn’t make use of either of those features on this trip. At about 9:45 pm, I made my way towards the gate for boarding. The gate was a fair walk away from the Clubhouse since most airport lounges at SFO’s international terminal are located right after security. I got to the gate just as business class boarding had started. Immediately after stepping onboard, I could tell this aircraft was different. It took me a minute to realize that this was not the Fiji Airways business class I knew. I was thrown for a minute and had to confirm with a flight attendant I was on the right flight since I had not expected this. It turns out that Fiji Airways had a last-minute equipment switch (which also happened on my last flight with them). In this case, our original A330-200 was substituted for a leased A330-200. 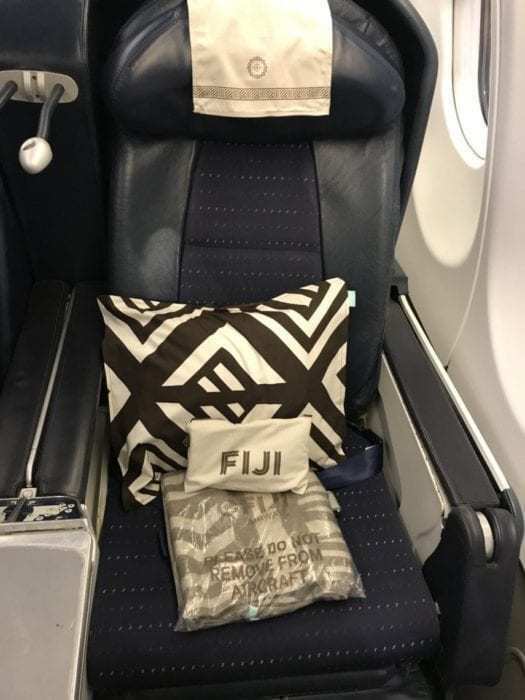 The leased Fiji Airways A330-200 only had three rows of business class in a 2-2-2, whereas normally Fiji Airways has four rows of business in a 2-2-2 configuration. I was in seat 1A and the nice part about row 1 was that there was additional legroom. This made it a bit easier to get out of my seat without disturbing my seatmate. 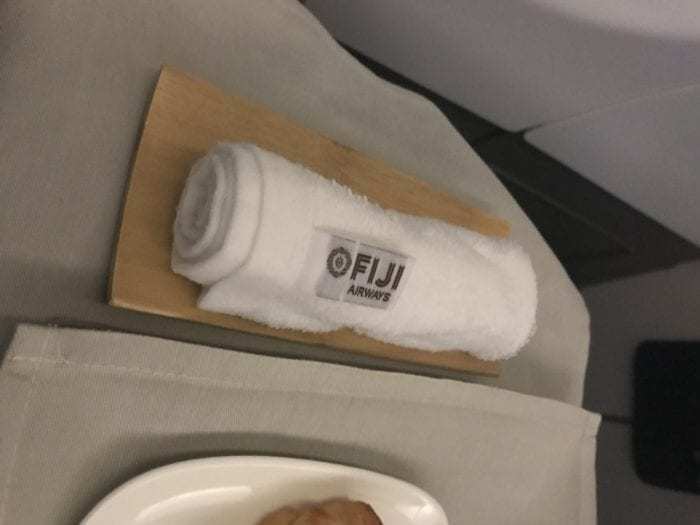 At each seat were the standard Fiji Airways amenity kit, pillow, and blanket. 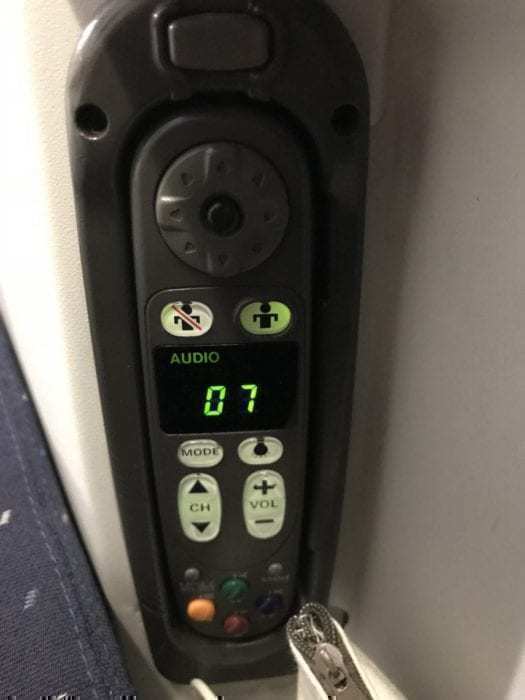 The seat controls were located on the center armrest. The seat control panel was worn and coming apart. I would later discover this was a common theme of this product. Below the seat controls was the only storage area in the entire seat. The power port and remote control were located there. About halfway through the flight, my seat started to come apart in various places. The paneling around the seat controls kept popping out and the covering of the left armrest also fell apart. Normally, in this configuration, there is a privacy partition that can be raised between the seats. It is usually a large partition that does a lot to privatize the experience. Well, in this case, I had a bit of an abnormal seat. The privacy partition between the seats would not stay up. When I asked a flight attendant she shrugged and said it was pretty normal for the aircraft to be in this state of affairs. Yikes. Without the partition, it made it seem like I was towering over my seatmate when she was sleeping and I was up. It also worked the other way around. 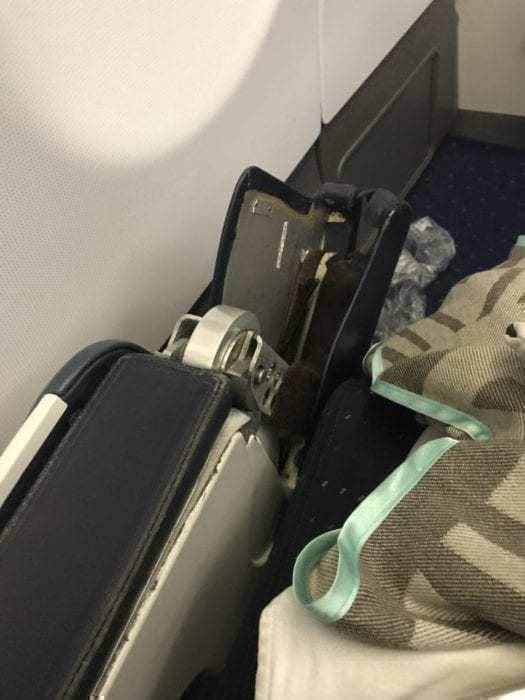 Since most people would probably be traveling with a friend or relative on a flight like this, it might not be a huge issue. But, I would say that Fiji Airways could definitely fix a few things with the seat. The worst part about the seat was how uncomfortable it was. Since this was an old product, the padding had worn out completely and you could feel some of the structure of the seat. If I wasn’t running on four hours of sleep, I probably would have had immense difficulty sleeping. I woke up incredibly sore. 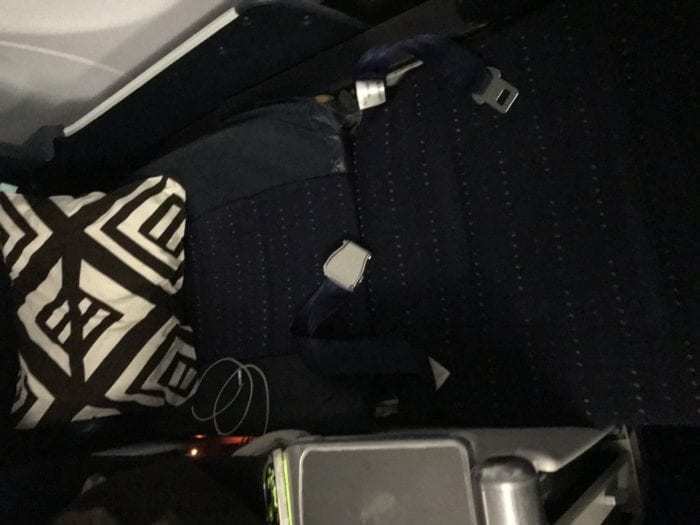 Fiji Airways provided no mattress pads and didn’t have additional blankets to place over the seat. Fiji Airways provided the same headphones as on all my previous Fiji Airways flights. 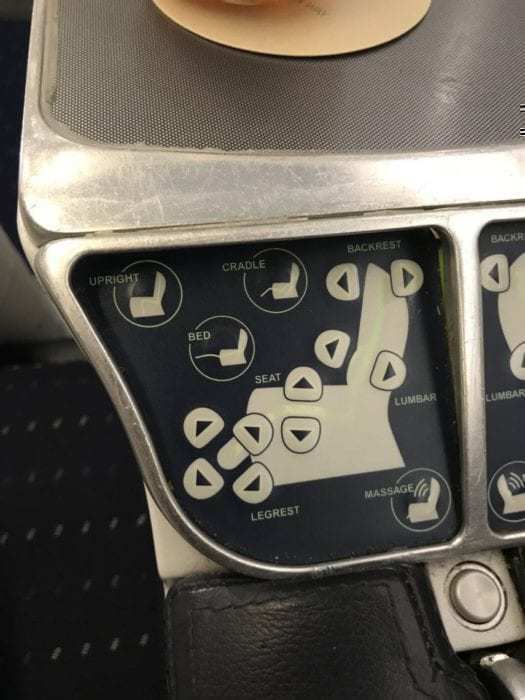 The IFE monitors could be removed from the center armrest. They were relatively small and very outdated. The selection was okay with some new releases, mainly Oscar winners. A few minutes after takeoff, I was presented with an iPad. It was a much nicer display but had the same content as the monitor. I do prefer seatback screens to using a device since during meal times it is hard to balance both the meal and the device. I did have to use my own headphones for content on the iPad. The headphones provided could only work for three-prong jacks. Wifi was not available on this aircraft. 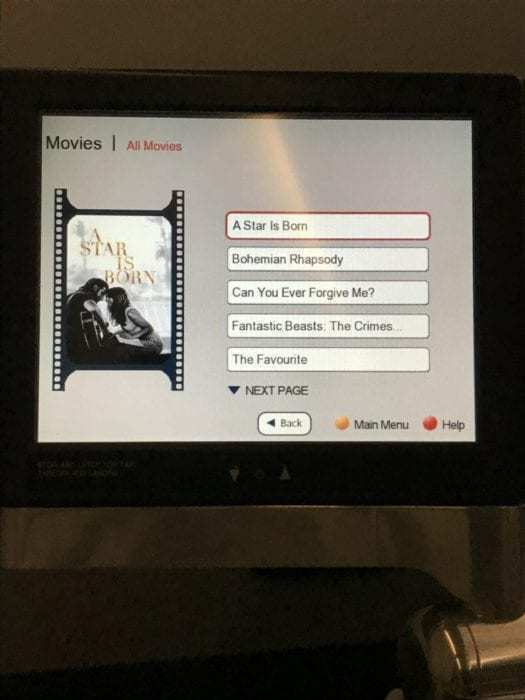 The menu for the flight was presented to me after settling in. The pamphlet had both the outbound and inbound flight menus. 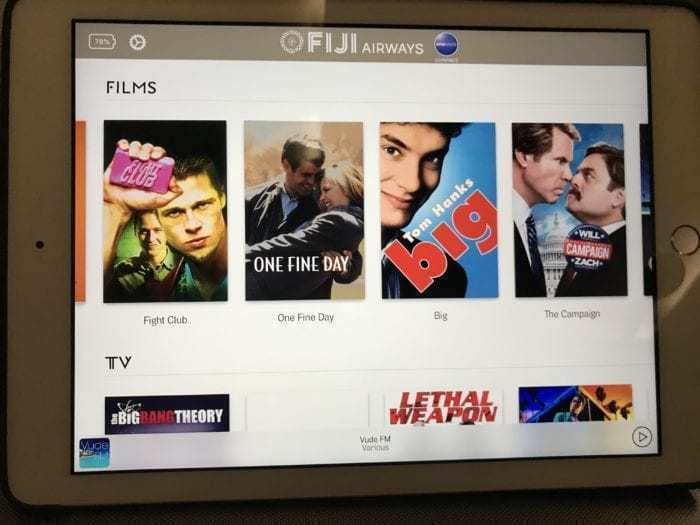 Fiji Airways seems to use the same menu on all flights departing from Fiji and the same menu on all flights departing from San Francisco or Los Angeles. I would imagine Fiji Airways doesn’t expect a lot of travelers to fly with them frequently. The wine list was the same as my outbound. I was presented with a pre-departure beverage when I turned in my breakfast card. 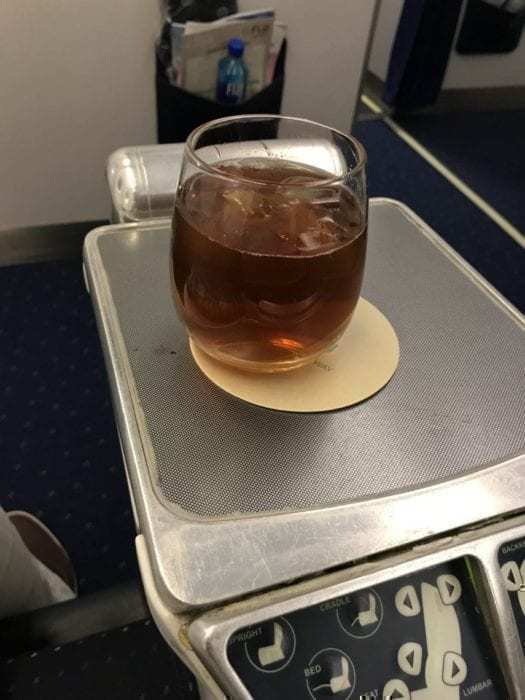 About 30 minutes after takeoff, flight attendants served drinks. 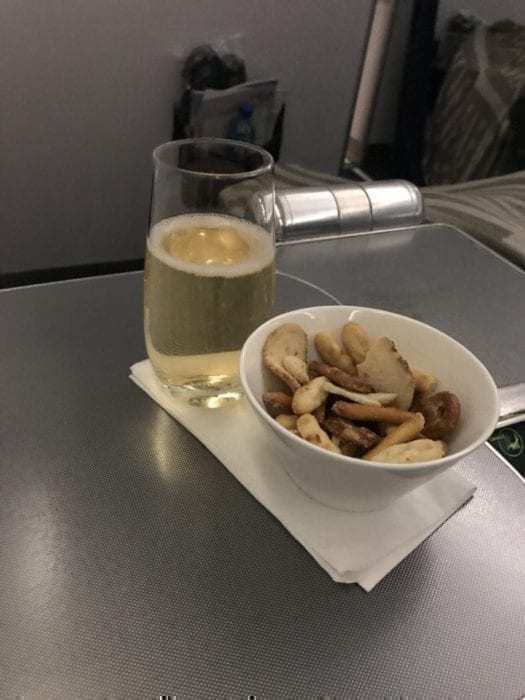 I selected a glass of champagne and it came with a salty snack mix. We received hot towels with the meal. After drinks were served, flight attendants came around to take meal orders. 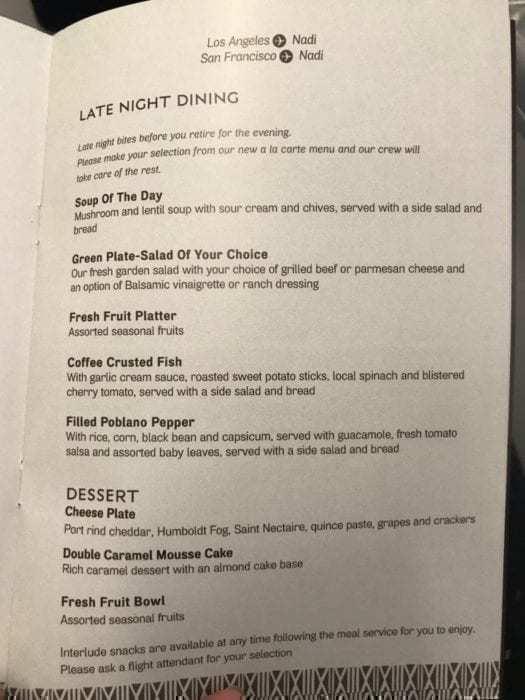 Fiji Airways offers a “Late Night Dining” experience. The idea is to only select one item from the menu as your meal. Although, I’d expect the soup, salad, or fruit to be a starter. So I did order the soup and fish. The flight attendant informed me that this would not be possible unless there was remaining soup. Given the late departure and most passengers choosing to sleep right after takeoff, I did get soup with my meal. This was perhaps the worst possible meal I’ve had in business class. The fish was tasteless even with the addition of salt and sides. 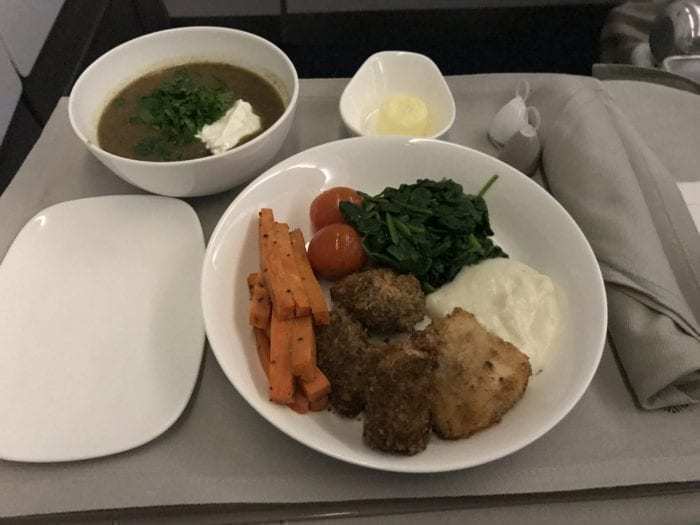 Compared to other Fiji Airways meals, this was a surprise to me. I’ve genuinely enjoyed their previous meals. Not the case here. This was far inferior to the meals you can get on some flights. The highlight of the meal was dessert. I went with a double caramel mousse cake that was very flavorful. 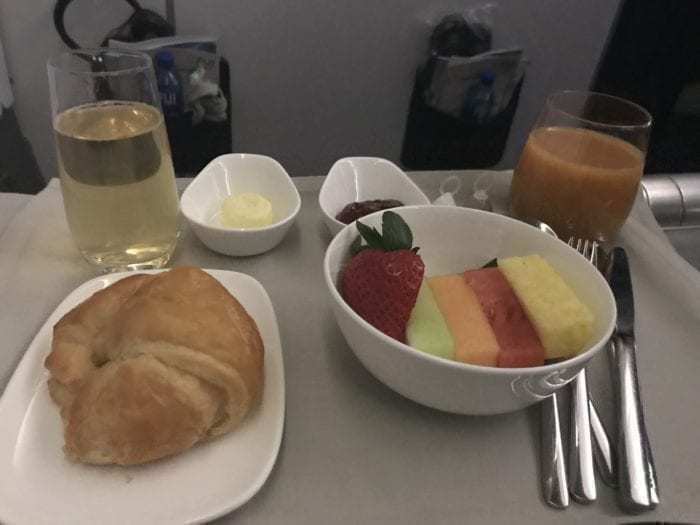 On the bright side, 90 minutes after takeoff, the entire meal service was complete. I reclined the bed and went to sleep. I woke up just as the breakfast service began- 2.5 hours prior to arrival. On my breakfast card, I indicated that I wanted coffee with my meal. Instead of coffee, I received a glass of champagne. I asked a flight attendant to swap it out for me, but she never did get around to getting me a cup of coffee. The fruit was as fresh as one would expect refrigerated fruit to be. It definitely wasn’t a highlight. Soon after, I got my main course. I selected the mixed vegetable and spinach frittata. This came with a side of sausage and mushrooms. 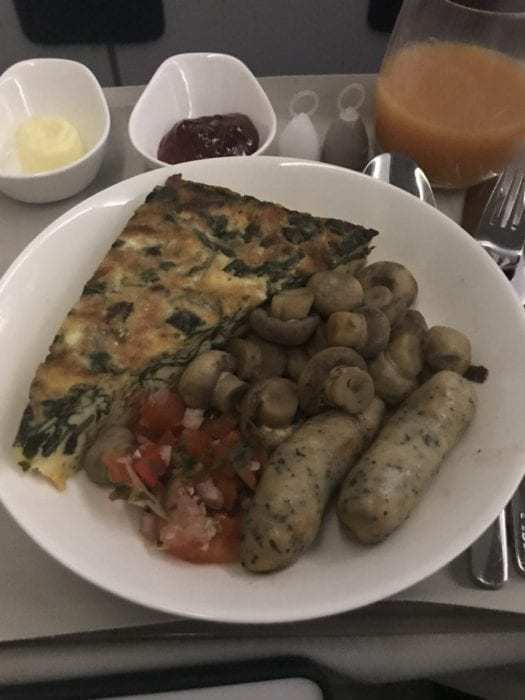 Breakfast is usually a really uninspiring meal on a plane. This was the same. The sausage was rubbery and a bit cold. The frittata was warmer, however, it was bland and not filling. I ended up eating only about one-fourth of the meal. Fiji Airways usually has pretty good cabin crew. This flight had a decent flight crew who went through the motions. However, the service was mixed. Some flight attendants were proactive and seemed happy to be there. Others, however, were cold and seemed like they didn’t want to bother. Only a few flight attendants addressed people by name. Not a big deal, but it does show that some flight attendants put more effort into making a great flight than others. I arrived in Nadi and discovered that my luggage didn’t make it. When I checked in at Los Angeles, the agent requested I check both of my bags all the way through since, most likely, my carry-on would have to be gate checked. Since both bags had shocking red “Priority” tags on them and that my “layover” in San Francisco was over 11 hours, I thought my bags would make it. I was wrong. Fiji Airways lost my bags. After running around Nadi airport for seven (!!!) hours, I finally was able to file a baggage claim report that indicated I needed my bags delivered to me in Sydney, Australia and not in the US or in Fiji. At the end of seven hours, Fiji Airways was still unable to figure out where my bags were. I spent 30 minutes on the phone with American Airlines who were able to track my bag to San Francisco and put a visual on it. However, since the bag had technically been transferred to Fiji Airways, they couldn’t do anything. In fact, I was asked by multiple Fiji Airways ground staff that to leave their queues since I wasn’t flying with Fiji Airways. In fact, at the end of the day, it was the Qantas baggage handlers in Sydney who got my bags back. More on that in a minute. After much back and forth, I was able to get Fiji Airways to transfer my bag to Sydney on the Qantas flight arriving the next day. Well, Fiji Airways tagged my bags to Nadi. Since their flight out of San Francisco only operates twice a week, my bags were set to go to Sydney on the Qantas flight. Except, my bags would route all the way to Nadi from Sydney. Then, my bags would fly back from Nadi to Sydney. Effectively, this would delay my bags by about two days. Fiji Airways advised me to go to the Sydney airport after the flight lands to tell them to halt my bags. So, at 5:00AM I made my way to Sydney airport where I spent two hours getting Qantas to release one of my bags. They were able to track down my carry on, scratched out Nadi, and had my bag delivered to me later in the day. It turns out that my second bag had gone to Nadi via Melbourne. Then, Fiji Airways flew my bag from Nadi to Sydney. So my second bag arrived a day and a half after I received my first one. Would I fly Fiji Airways again? In this case, probably not. The customer service from Fiji Airways was downright horrendous. After comparing some of the other bag tags coming on the carousel, I did notice that other passengers connecting from Alaska Airlines or American Airlines received their luggage. Fiji Airways is also notorious for long-haul last-minute aircraft swaps. Prior to this flight, the seat map indicated we would be on one of the aircraft Fiji Airways owns. This changed on the day of departure. I’d much rather get to Fiji via Air New Zealand. And once Qantas starts service to Fiji, I would look forward to flying with them. In addition, Virgin Australia offers flights to Fiji from multiple Australian cities. That being said, if I was traveling with someone and not connecting with checked bags, I probably would choose Fiji Airways for flying to Nadi. They routinely have pretty decent business class fares. we recently travelled from Nadi to LAX. We paid for “extra comfort” seats at the bulkhead. One of these seats was broken in several ways. The purser was sympathetic and provided email addresses for us to obtain a refund. I have sent 4 emails all of which have been ignored. It’s impossible also to get points to your AA account. Fiji Air/Air Pacific are way below what they used to be. That’s awful you were unfortunate to have a leased 330 instead of their actual FJ 330. I’m flying in a couple days myself on this route. Fingers crossed.